The 12 pound Coehorn Mortar was actually a "short-barreled" cannon used by both sides during the American Civil War. Most of the smaller Civil War Mortars had their barrels fixed at a 45 degree angle. These mortars varied their range by adjusting the amount of powder used. Mortars are designed to launch an exploding cannon ball at very high angles so as to drop almost straight down during their final decent. The Civil War Mortar was ideal for "lobbing" shells behind the steep walls of enemy fortresses. The Coehorn Mortar Model 1838 was named after the Dutch inventor Baron van Menno Coehoorn (1641-1704). The most common Coehorn Mortar was "24-pounder" that weighed almost 300 pounds and required 4 strong men to maneuver it into position. It fired a 24-pounder shell (actual weight of 16.8 pounds) using 1/2 pound of black powder to a maximum range of 1,200 yards. Later in the Civil War, a smaller, lighter, 12-pounder Coehorn Mortar was also used. It weighed less than half that of the original 24 pound model and was easily handled by a team of only 2 men. This is the model I chose for my cat hunt. The "pound" designation (12-pound) in the name " 12 pound Coehorn Mortar ", refers to the weight of the projectile that this Civil War Mortar shoots. Ideally, a solid cast iron ball of the exact bore diameter would weigh 12 pounds. In actual use however, projectiles weighed somewhat less because they were hollow cast and filled with 82 lead .69 caliber musket balls and black powder. Fuses in these Balls could be timed from 5 to 30 seconds depending on the desired range. All artillery cannon and Mortars with smooth bore barrels were described in the "pound" weight of their projectiles. ( like a 12 pound Coehorn Mortar ) Artillery pieces with rifled barrels were described in the "inch" measurement of their bore diameters and were called "Guns." ( like a 3 inch Gun )"
So, what is a Feral Cat? It is a free-roaming "wild" cat that is no longer domestic. 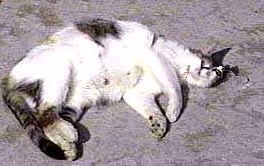 Most Feral Cats were "let go", out in the country, when their owners decided that they no longer wanted them. There they are free to breed and raise subsequent generations of "wild" offspring. Most Feral Cats are un-approachable by humans and kill thousands of song birds and wild pheasant and grouse chicks each year. They cause damage while scrounging for food, they carry diseases, and they bite. Interestingly, a recent attempt was made here in Wisconsin to pass a law that specifically allowed "Feral Cat Hunting". Although most hunters were in favor of this law, it was vetoed by our Governor. Therefore, I have decided to attack this nuisance Feral Cat problem by myself, single-handed, and go a-field "Feral Cat Hunting" with my 12 lb. Coehorn Mortar. First, you have heard me say this before, ... I am pretty sure that it may not be entirely legal to use a Coehorn Mortar to hunt Feral Cats, ( or any other game for that matter ) at least not here in Wisconsin, so carefully check your own State's regulations..
Now, I'll give the standard disclaimer ... "Don't try this at Home" ... "Leave it to Professionals." 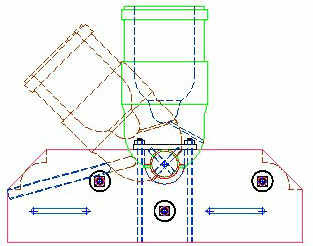 THE " CAT HUNT "
I can supply detail drawings of my "full scale" 1838 12 pound Coehorn Mortar complete with Mortar Bed. 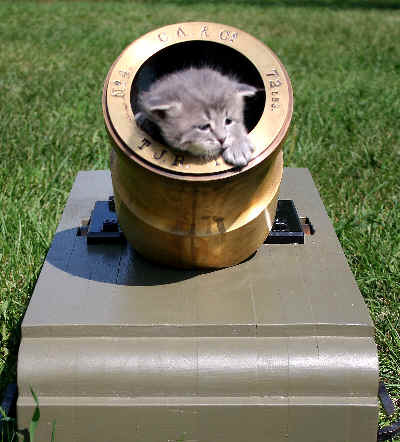 To begin with, one must decide on a proper load with which to shoot a Feral Cat using a Coehorn Mortar Cannon. Developing a load for your Coehorn Mortar can be a bit tricky. I started with 2 standard 35mm film canisters full of Fg black powder under one of my 2-1/4 pound Mortar Balls. Grain weight of 2 film canisters of powder was 1,100 grains. That load was a bit too hot. . . ? ? ? Cutting back the powder to just "one" film canister full, gave a nice 400 yard shot with reasonable accuracy. By randomly changing the powder charge and slightly adjusting the Coehorn Mortar angle, I finally settled in at 350 yards with about a 15 second hang time for the Mortar ball. The "hang-time" is the time delay from when the Mortar is fired until the ball reaches the target. 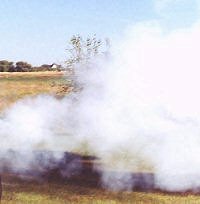 This 15 second hang time proved to work quite well on the Feral Cat hunt because by the time the sound reached the location of the Cat, ( or Cats ) about 1-1/2 seconds after firing, the cat would "perk-up" and look in the direction of the sound, and then see the distant white smoke of the Mortar. Shortly after, he would sit and gaze whimsically at the approaching cannon ball, fixated in place, as the ball of the Mortar would silently race closer and closer. I like using dark colored Mortar balls because the Cats can easily see them silhouetted against the bright sky. The 350 yard range is about the optimum range to observe your Mortar shot. Surprisingly, you can watch the Mortar ball as it flies thru the air. Its like watching a "pop fly" at the softball game, only higher and farther. 350 - 400 yards is far enough away to allow your shot to go undetected. It gives you plenty of time to reach for the binoculars to observe your target impact attempt. I say attempt, because it will likely take you several shots before you are successful in hitting the intended target, namely the Cat. A word about Baiting. Each and every Feral cat on earth is always hungry. In order to lure your Feral Cat into the down-range target area, it is necessary to use some type of bait. Exercise caution when bating because "over-bating" may actually increase your Feral Cat problem. Its a delicate trade-off. 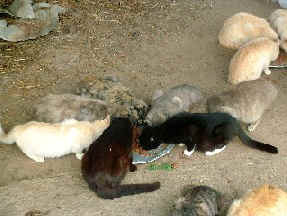 A single Feral Cat is very difficult to hit, whereas a bunch of hungry Feral Cats crowded in the target area makes the chances of a Mortar hit more likely. However, a bunch of hungry Feral Cats coming regularly for food is not a desirable outcome either. 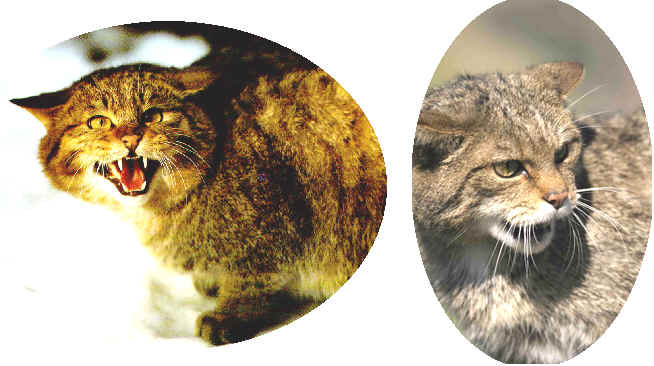 Over baiting can result in every hungry Feral Cat from a 10 mile area coming to your target bait. Use you best judgment. I would suggest lots of bait until you have a few Mortar kills under your belt. Then cut-back on the bait and concentrate on accurately hitting a single target cat ( or a breeding pair ) rather than trying to group shoot into the bunch. What to use for bait? You guessed it, "Milk" is best, although cheap cat food also works well. I prefer milk because it can be reused and it doesn't create a big clean-up issue. You can keep using it for days on end. Hungry Feral Cats will come to it even if it goes sour. A successful technique is to put some in a squirt gun and sprits it around the area to create a large milk scented trail into the smaller target zone. However, one word of caution on bait containers. I would suggest using unbreakable bowls made of tin or paper since you don't want to smash your wife's good soup bowls from random Mortar hits. Wives are not very understanding when you break their dishes. As a matter of fact, they're not too keen on Cat Hunting with a Mortar either. Believe me, I speak from experience. Personally I prefer using lots of Tin pans. The reason for this will become obvious in step 5. 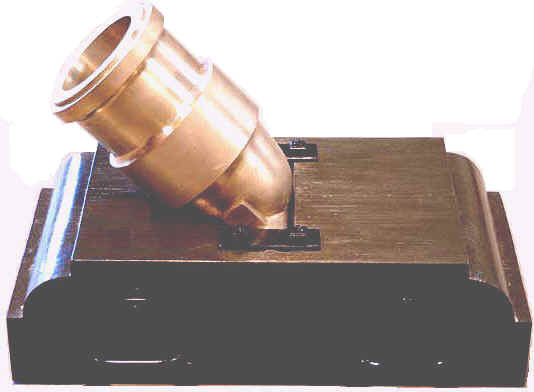 NOW, ... there are several very important steps that should be done to avoid potential problems during your Feral Cat hunt with your Coehorn Mortar. I've broken things down into 10 easy to follow steps for a successful and safe Mortar Cat hunt. 1. Choose a hunting area where you can clearly see all around the Target bait. This is a good idea because we're working with extended ranges of 350 - 400 yards. A good system is to set-up the Mortar at the back of the barn, and place your baited target area at the back of the 40 acre field. Fire 4 - 5 shots and mark the location of each Mortar ball. Then place your bait in the exact center of this group. If you provide a stable base for the Mortar bed, all your shots should be with-in a 20 foot circle. Coehorn Mortars are very accurate and with practice you will be able to consistently group all the balls within a 5 - 10 foot circle. 2. 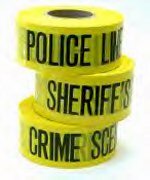 Mark your down-range target circle with "Danger-Tape", the kind of tape that says "Police Line DO-NOT-CROSS" is a good choice, or, "DANGER --- BLASTING AREA" is another good one. You will need only about 100 yards of this tape. Unlike deer hunting with a cannon, Mortar hunting for Feral Cats is an "off-season" venture with very few ( if any at all ) other hunters around. Lay the tape on the ground creating a 100 foot diameter circle around your target bait. This won't keep the Moreons from wandering in ( those you'll have to watch for ) but it should keep out most people with even the slightest bit of common sense. If you own or lease the land, it would be advisable to also post NO TRESPASSING signs all around the property. Since the trajectory of the Mortar is nearly "straight-up" at the firing source, and nearly "straight-down" into the target area, it's not necessary to place any Danger-Tape along the flight path of the Mortar ball. A small 20 foot semi-circle of tape at the Mortar Launch site is all that's needed to keep all the spectators behind the muzzle of the Mortar. 3. Unlike Deer hunting with a cannon, Mortar hunting is somewhat of a spectator sport and can be enjoyed by several people or a small group of people at the same time. Since you are quite distant from the target area, you won't even have to whisper. You will find Mortar Hunting to be very relaxing. Everyone can take turns keeping an eye on the target area with binoculars. Then, when a Feral Cat is lured into the target area, everyone grabs their binoculars and watches. Now you alert the Mortar Captain that it's time to shoot. There is no real rush since the bait will usually holds the target cat for quite some time. The relaxing sport of Mortar hunting for Feral Cats is actually a lot like fishing; bait and wait. 4. Since Mortar Hunting requires no critical " timing " it is possible to use any of several ignition sources to fire the Mortar. You can use a piece of very in-expensive Cannon Fuse, or you can use a " friction primer". A friction primer is a small copper tube that contains powdered chemicals similar to those found on the striking end of a farmer's match, namely the friction compound. It also contains a small charge of fine black powder. A coarse wire with an exposed loop runs through the friction compound. When the wire is "jerked" out of the friction compound, it ignites the black powder inside the small tube, which in turn shoots a flame into the Coehorn Mortar's chamber. This neat little device gives instantaneous ignition with no delay. It was invented during the Civil War and was used with all types of Artillery on both sides. If you need to buy Friction Primers, e-mail me. The Advantage of the friction primer is that it requires no open flame. There is nothing to light. You simply place it in the fuse hole of the Coehorn Mortar and attach a long pull-cord ( lanyard ) to the wire loop. Pulling the cord, sets off the Mortar. The Quill Fuse is also a good choice for ignition. 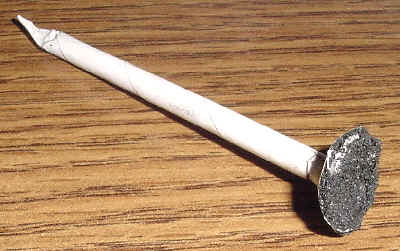 A Quill Fuse is a prefabricated paper fuse that is made from a paper straw and filled with black powder. The name "Quill Fuse" comes from originals which were actually made from the quill of a Goose Feather. The Quill fuse has a large "target" spot which is simple to hit. The target spot is coated with fine powder and lights very easily. ( Unlike standard cannon fuse which can be difficult to light. ) Also, the Quill fuse is more predictable than regular cannon fuse because it burns very quickly, usually less than one-half second after it is ignited with a linstock or slow match. ( smoldering rope or "punk" ) See this page for more information about Quill Fuses. One cautionary note. Be very careful not to stand directly behind the Mortar when you fire it. 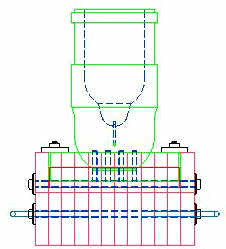 The high pressure gasses expelled from the Fuse Hole during firing can propel a piece of the fuse or part of the spent friction primer, at very high velocity. Its actually like a small speeding bullet. Unlike cannon which have their fuse holes on top of their tubes facing straight up, Coehorn Mortars have their fuse holes close to the ground pointed rearward, so its easy to overlook this hazard. Some people add a deflection plate behind the Mortar to reduce this hazard. 5. When an unsuspecting Feral Cat happens to wander anywhere into the Target area, "Shoot the Mortar". There is no need to specifically aim since you've already "sighted-in" the Mortar. Each shot is somewhat of a random chance that you will have a hit, or a miss. Even if you do miss, there can be a tremendous thrill of the hunt if you happen to hit any of those "tin" bait pans. The ensuing "pan noise" will absolutely SCARE THE LIVING CRAP out of the unsuspecting feeding kitty. This is the reason I prefer to use "many" small metal pie tins with a trace of milk in each. With a dozen or more of these small tins packed in a 10 foot circle, you're bound to hit at least one every few shots. Imagine " hungry kitty " licking some milk, when suddenly, and silently, a 4-1/2" diameter cannon ball drops down from the sky and crashes noisily into a tin pan next to the cat. I've seen some cats jump 20 feet in the air, and come down and crash into another pan or two! Such a "near-miss" episode is nothing short of spectacular to behold. Now, a word of CAUTION, always wait at least 1 minute before reaching into and starting to clean the bore of the Mortar after it is fired, just in case there remains some smoldering powder that could "flare-up". Then, wet-wipe it thoroughly and dry-wipe it out as well. You want to make sure that no smoldering embers remain in the Mortar tube before adding more powder for the next shot. For this reason, the written rule is to wait " at least " a full 3 minutes before reloading the powder. In addition, the 4-5 minute delay for reloading usually results in the hungry Feral Cat coming right back to the bait. If you are lucky, and you have a really, really hungry Feral Cat, you can get shooting at the same Cat for several hours. 6. When the quiet of the morning is suddenly interrupted with the tremendous loud .. WHOOSH .. of the Mortar, you've done it. You've shot your first shot and you're Mortar Hunting. Most Mortars do not make the big BOOM so typical of Cannon, rather it's more like a low toned Whoosh or Thunder. When the smoke clears, carefully check with your binoculars if you've made a hit. If not, start timing for the reloading process and patiently wait for hungry kitty to return. If you've got a HIT, grab your camera, you won't need anything else. Take dozens of pictures to insure that one turns out because you'll be hard pressed to keep your camera steady - because - you'll be very shaky from all your laughing. 7. If a Stranger wanders by and asks what you're doing. Ask him what he thinks of the Feral Cat problem in the area. If he starts talking like a wimpy "bunny-hugger", get rid of him. Tell him he's trespassing. Nice thing about being 400 yards from the target area is that no one knows what you are up to unless "you" clue them in. It just looks like you are Target shooting your Coehorn Mortar. 8. Now, if you suddenly see People in Uniform coming your way, you've got a different problem. THIS IS IMPORTANT ... You have to get to the baited Target area, FAST. You will need to get there before they do, so run if you have to. When you get to the bait area, you have to "get-rid-of the bait" and you'll be in the clear. Nice thing about milk is that its easy to dump. ( Canned cat food can be a real problem here. ) No need to pick up the pans, just turn them over, which spills out the milk. If questioned, simply explain that the pans are all part of your intended targets for your Mortar practice. Tell them you like the way they sound when the Mortar ball hits them. If you keep a tight lip, and don't smile too much, no one will ever suspect what you are actually doing with your Mortar. Only YOU can get yourself into trouble if you confess to anything. 9. After all is back to normal, you simply turn the pan (or pans) back to their upright position, and refill them with more milk. Chances are the same hungry kitty will soon return and you can continue your hunt. 10. In unlikely event that you have "no luck what-so-ever" and you find yourself hitting a Feral cat with you Mortar at the very same time as Uniformed People show up, KEEP COOL . There is still a chance that the Warden ( or whatever ) will hate cats. Statistically, Over 60% of people in general hate cats, so the odds are in your favor. There is also a chance that he or she might have a sense of humor. To probe this, explain that ... " there you were ... minding your own business ... shooting your Coehorn Mortar at pans filled with milk ... when, wouldn't you know it, a really stupid cat wandered right into your target area." Explain that ... " Darwin's Law must have put that cat's head right under the cannon ball in order to remove him from the feline gene pool." If after all this, you are still in trouble, remember there is always a 60/40 chance that the Judge will also hate cats. The Judge might even have a sense of humor when he exclaims to the Game Warden, .............. "You telling me he intentionally hit a Cat with a Cannon ball at 400 yards?" Be sure to take a lot of pictures of your successful Coehorn Mortar Cat Hunt so you can show all the grandkids. This wonderful trophy was taken at 11:00 a.m. on July 22nd, 2005 at 385 yards. The Coehorn Mortar Cannon Ball Head Shot . . . . . . ! ! ! ! ! ! Next, we'll test how far you can shoot a Feral Kitty - 4 weeks old is perfect bore size. Please feel free to circulate this to as many interested people as you like .... its time we started having some fun with our Mountain Howitzer Cannons.